Not much happening since Saturday. Craig and Connor arrived mid afternoon with a barrow load of ready mixed cement and set about laying the final steps and reinstating the side access slabs. Since then the weather has been atrocious with heavy tropical style rainstorms. Yesterday, the final slabs were laid. However, the heavens opened and to quote the song “Down came the rain”. The side access has always turned into a water chute during stormy weather, so much so that we have considered making into a water feature. Yesterday was no exception. There was so much rain water and the cement was so fresh that the last paver laid has shifted. The guys will have to come back and re-lay it, when we have a dry day. 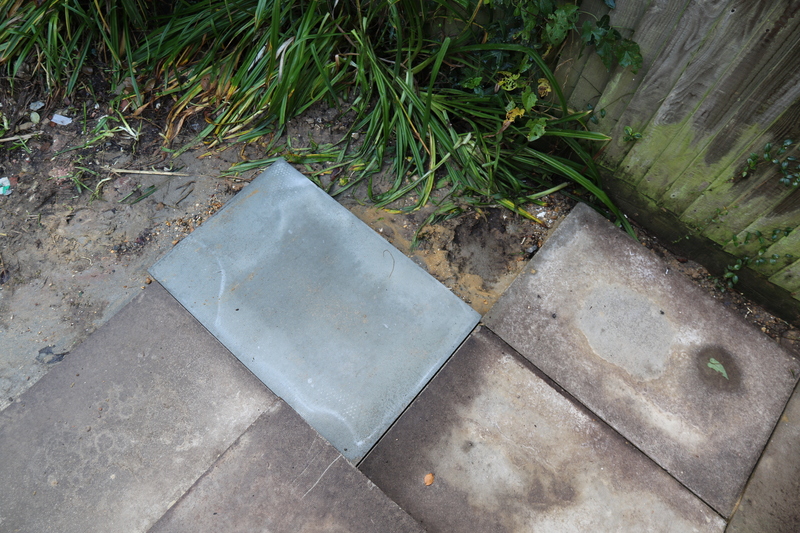 Then they can also grout the slabs on the steps. Also putting in an appearance yesterday was Angus. Conservatory – Door stay fitted. 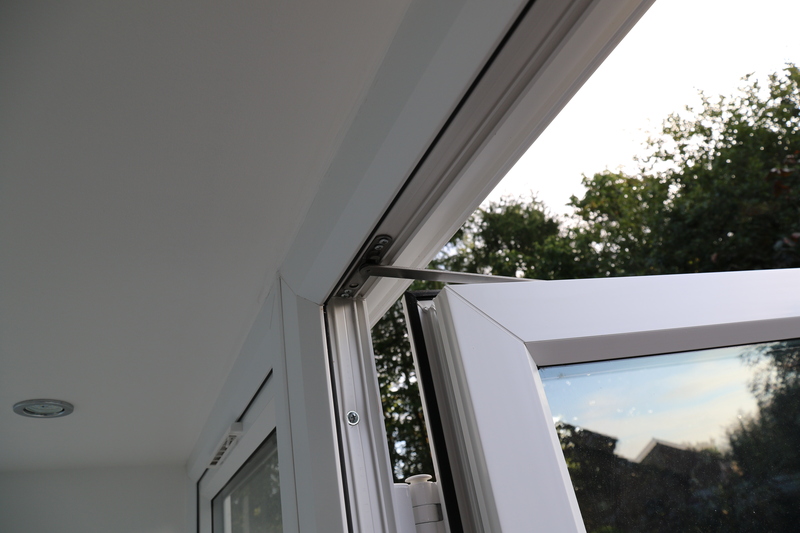 He arrived and fitted the “stay” for the utility room door as well as making good the soffit that had been cut away to make the connection between the bungalow and the new conservatory. We are creeping towards completion. The search for the Scarlett Pimpernel goes on unabated and needless to say we are still minus the radiator for the living space, which in turn is preventing the last strip of skirting from being fitted. The bi-fold doors are still missing their magnetic catch, as well as the last bit of rubber seal and the hidey / slidey door furniture is still to be fitted. We also have some issues with the final finish of some of the plasterwork around the perimeter ceiling but these are all minor items and shouldn’t take long to sort out. No, the big issue, and the worst irritant is the missing radiator !! This entry was posted in Local (To Me !!!) and tagged cement, conservatory, Executive Windows, grout, paving, plumber, radiator, rain, skirting, soffit, water. Bookmark the permalink.